Dave Peabody blues musician worked at Collets. How did you come to record your legendary first album? Well there used to be a London record shop in New Oxford Street called Collett's, which sold all sorts - jazz, folk and blues, there was a book shop there as well, which was run by Jill Cook and Ray... ah, I can't remember Ray's second name but he's still got a record shop near Shaftesbury Avenue called Ray's Jazz Shop. Jill was head of the folk section and ran a few clubs herself, if you wanted to know anything about clubs or singers or wanted to contact someone from that scene, that was the place you'd go. It was through her that I met Bill Leader. Bill was a field recorder, recordist or whatever who was working for Transatlantic records at the time. A number of points to add. When New Oxford Street was re-developed, the Jazz and Folk Record Shop moved to Shaftesbury Avenue. 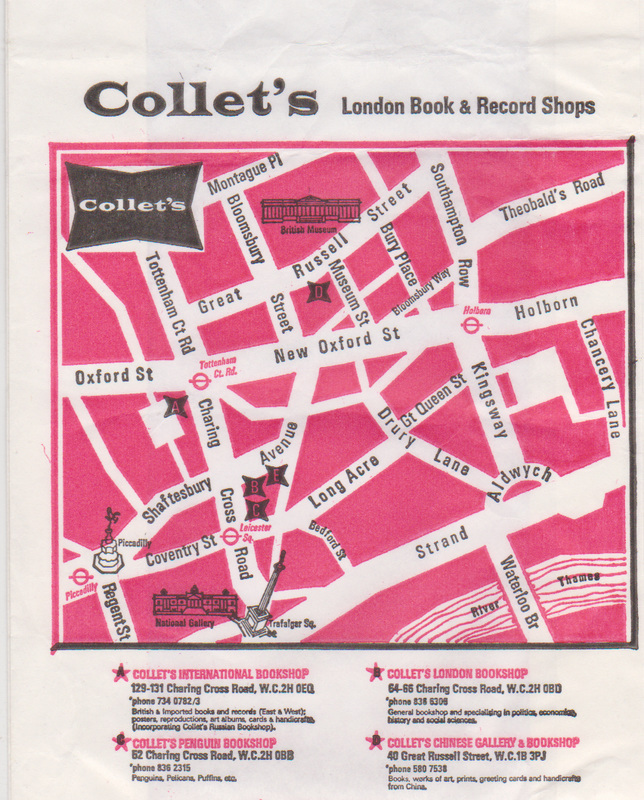 Collets had several other places which were mainly bookshops – Collets London Bookshop (politics) and Penguin Bookshop (both on Charing Cross Road), Chinese Gallery (opposite British Museum), International Bookshop - the “new” one by the Astoria. This had relocated from Museum Street. The Folk music went to the basement of the new store but not the jazz – that stayed with Ray Smith, Bob Glass and I to become Ray’s Jazz Shop. When the record shop was in New Oxford Street, Ray ran the jazz in the basement. Noel Norris worked part time and I recall he and Ray used to shoot Russian Melodiya 78s with an air rifle in the back storeroom, shellac exploding everywhere. Ray’s favourite was a 78 called “I’m In Love With My Tractor”. For more about Ray (and Collets Jazz) see Rays Jazz on Cargo Collective website. The upstairs Folk Dept. was very important in the 50s and 60s in the development of British Folk music, with many visitors and musicians hanging out there. Bill Leader worked there and it was run by Gill Cook with Hans Fried. Piers Harker joined later. Bob Glass (married to country blues singer Jo Ann Kelly) worked in both folk & jazz sections. When Bob Dylan was based in London in 1962 he struck up a friendship with Martin Carthy, a frequent visitor to Collets, and Hans met Dylan on several occasions. Dylan apparently told him of a planned BBC TV performance (Evan Jones’ play “The Madhouse on Castle Street”) that he was in. Dylan was supposed to be the lead part, but that went to David Warner, Dylan singing some songs for it and having a brief part. 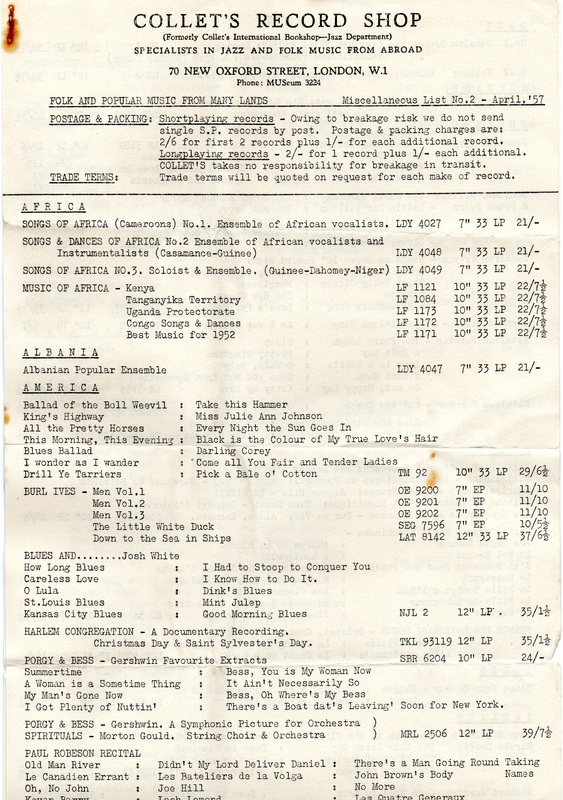 Hans recorded the songs from his TV and these were featured on a later BBC documentary. It was during this time that Dylan recorded, as Blind Boy Grunt, for Doug Dobell’s ‘77’ label with friends Eric Von Schmidt and Richard Farina. Comment: Mathew Wright. Re Jill/Gill Cook who ran the folk department and was the mother of Bert Jansch's first child Richard. A small correction. I have several letters in my possession from her to Bert Jansch concerning Richard showing that the spelling she used was Gill. Heather Jansch. 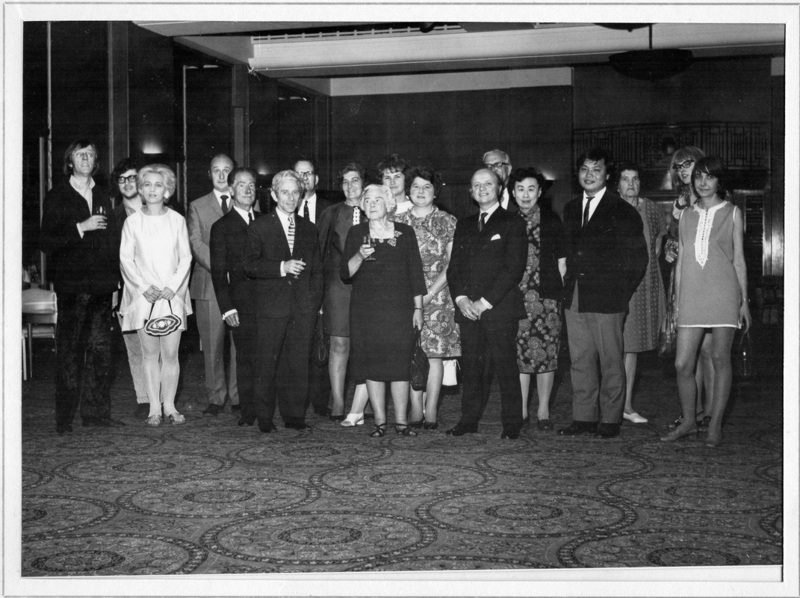 (Sept 23, 2013) Jonathan Hill said:I used to hang out a lot in Collett's in Shaftesbury Ave. in the mid '70s. 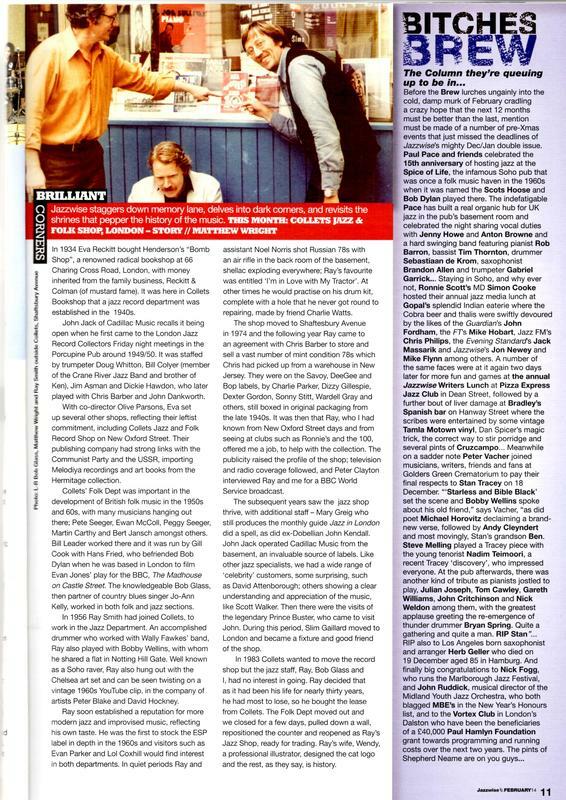 A very pleasant lady called Gill said to me " Have a listen to this, you'll love it! It's really bad taste!" I did, I do, it was (in the best way possible). I have been a fan of 5 Hand Reel ever since. She knew the stuff I bought, and she also had a pretty good idea when I was skint and when I was flush I think! So, Amazon, iTunes, Spotify...... shuvvit! (June 10, 2012) Charles Topham said:I had the priveledge of working saturday's at the old shop and then three to four days a week in the basement shop which was much smaller. It was a real blast working with people like Jill Cook, Piers Harker and Bob Glass..they taught me everything i know about really listening to music and their knowledge was beyond price. (April 29, 2015) started shopping for records in Soho in the late 60's. I joined the trade in the early 70's as a delivery driver for Continental record distributors in Dean Street. The worked in the stock room making up orders and packing records. I moved to Collects's fold records in New Oxfrod Street in the mide 70's, selling over the counter. Shortly after, we were forced to move, to Shaftsbury avenue/Monmouth street. The in the ealry 80's the Folk shop moved into Collet'e international in Charing Cross Road. Thsi department closed in the late 80's. Comment: Piers Harker. (September 17, 2015) Entertaining stuff, and I love the image of Ray Smith shooting Russian 78s with an air-rifle, but isn't it Collett's (two t's)? Comment: Mike Butler. Cook did less and less in the folk department. We had the skilled assistance from Tony Russell for a year. We then got the wonderful help from the devoted Piers Harker. Many famous pop stars were customers. George Harrison bought loads of Indian Classical music from me. I loved working there. It was a folk Mecca. Hans ( June 22, 2016).